One day. 24 hours. 1440 minutes. 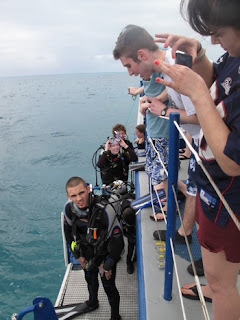 One crazy way to start a dive trip! Our SEA TURTLEs have officially started their Bahamas adventure. Over the past 24 hours they have said goodbye to their families and friends, flown the length of the East Coast and found themselves living aboard the R/V Coral Reef. Oh, and they took their first plunge into ocean waters. 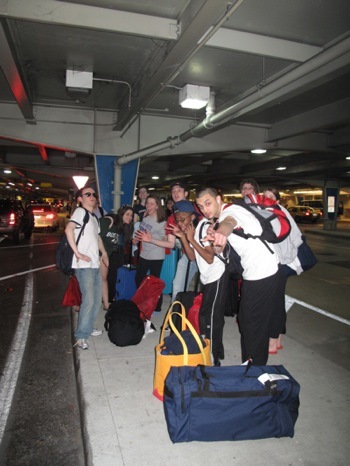 We made it to Miami! After arriving at the airport, we started down the Miami River at Friday morning at 6am. Yup, 6am. Wasn’t too early for our TURTLEs, however, as they were up early enjoying the sunrise on the front of the boat. 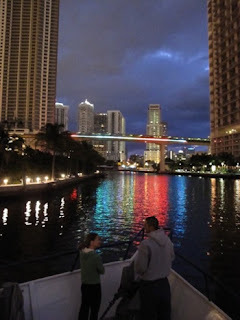 After passing underneath many bridges, we left Miami and headed for open water. We finished “the crossing”, steamed across the Gulf Stream and entered into Bahamian waters. Once we got settled and had some lunch, it was time to take the plunge. The TURTLEs broke up into two groups and away they went, each putting their skills into practice while diving in the turquoise waters with huge parrotfish! Getting ready-smile for the camera! Everyone can now breathe a sigh of relief. The first dive is complete, nerves are out of the way, and everyone has settled into boat life. Now we can enjoy the upcoming dives and get closer to that SCUBA certification! Tomorrow brings new dive spots and maybe even a beach seine to catch some fish. It should be a great day with more adventures. Hope the weather is nice. Looks like lots of fun! You TURTLES and instructors have worked so hard to get to this point. I'm really excited for all of you and I can't wait to read about all your adventures! Sounds like you are all having a fabulous time and it's only the beginning of an amazing week! Can't wait to read more and see more pictures...continue having a fun, exciting and safe trip! !